ww2dbaseWeather systems arrived in Europe from the northwest so the German military had a genuine tactical need to know the weather conditions in the northwest Atlantic in order to better forecast the European conditions. Several strategies were employed to gather this weather intelligence, among them an assortment of unmanned weather stations. The Siemens-Schuckert corporation of Germany developed one such system known as the Wetter-Funkgerät Land (Weather Radio for Land) or WFL. ww2dbaseMost of the components of the WFL were divided among ten cylindrical canisters about 3-feet tall by 18-inches across and weighing 220 pounds each. 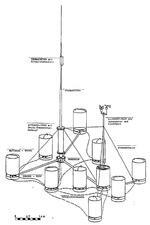 The rest of the system consisted of one 30-foot antenna mast and one 12-foot instrument mast. Nine of the ten canisters contained only dry-cell nickel-cadmium batteries and the tenth contained a few meteorological instruments plus a radio transmitter. The WFL was designed to broadcast weather readings in Morse code every three hours in two minute transmissions. The hope was that nearly a ton of batteries would allow the autonomous system to broadcast for upwards of six months. Siemens-Schuckert built 30 WFL systems. ww2dbaseThe reason the WFL was built as ten separate components of identical shape and similar weight plus two collapsible masts was so they could be more easily carried aboard a submarine. One system was loaded aboard Type IXC/40 submarine U-537 in Kiel, Germany in Sept 1943. In addition to the WFL equipment, two engineers from Siemens-Schuckert also boarded the U-Boat. U-537's commanding officer, Kapitänleutnant Peter Schrewe, guided the vessel across the North Atlantic and began carefully probing the northern reaches of the North American coast for a suitable location to deploy the weather station. ww2dbaseOn October 22, 1943, Kapitänleutnant Schrewe dropped anchor in Martin Bay on the northern coast of Labrador, then part of the self-governing Dominion of Newfoundland and now part of the Canadian province of Newfoundland and Labrador. A small party went ashore to scout locations and thereby became the only known armed landing of uniformed German forces on the North American continent during World War II. ww2dbaseA suitable spot was found and over the next two days, the ten canisters were wrestled out of the hull by hand and taken ashore piece-by-piece in inflatable rubber rafts. The two civilian technicians were assisted by ten crewmen as they set up the weather station. The station was christened "Kurt" after Kurt Sommermeyer, the senior of the two technicians. The station could not be immediately tested, however, since WFLs were designed to be activated by a timer once the delivering submarine had safely left the area. ww2dbaseThe canisters had been painted in a crude camouflage scheme and one was marked "Canadian Meteor Service" even though no such agency existed and the weather station was not in Canada. Empty American cigarette packs and matchbooks were left scattered around the site as well. ww2dbaseKapitänleutnant Schrewe then carefully guided the submarine back out through the uncharted channel and into the Labrador Sea. From there, Weather Station Kurt was heard to make its first broadcast – three minutes late. U-537 went on to conduct a more traditional submarine patrol. The weather station made its regular broadcasts every three hours as designed but within only a few days, its transmissions became degraded and then by mid-November it had gone completely silent, barely three weeks after it was assembled. ww2dbaseAt the end of its patrol, U-537 arrived at Lorient, France on 8 Dec 1943. The two civilian technicians and one crewman were disembarked before the U-Boat went out on its next patrol. On that patrol, the submarine was lost with all hands. That left only three people with any first hand knowledge of Weather Station Kurt and the station itself was no longer talking either. ww2dbaseThe pieces of Weather Station Kurt sat out on that exposed knoll for years without any known human contact. If any Inuit people happened through the station, there is no record of it. The general area was surveyed for early warning radar sites in 1952 but there is no notation of Kurt's discovery at that time. A team making a geological survey in 1977 came across the canisters but believing they were pieces of an abandoned Canadian weather station, they were barely given any thought. A few years later in Germany, a retired Siemens engineer, Franz Selinger, began research for a history of the company he wanted to write and he came across some of Kurt Sommermeyer's papers, including photos of U-537 in Martin Bay. He pieced together a few more details from German records but found nothing in the Canadian or US sources. After sharing his information with Canadian officials, Selinger sailed with the Canadian Coast Guard to Martin Bay in 1981 where the remains of the German weather station were recovered, 38 years after being placed there. ww2dbaseThe weather station canisters and masts are now on display at the Canadian War Museum in Ottawa, Canada. 22 Oct 1943 U-537 arrived in Martin Bay, Labrador, Newfoundland and began establishing Weather Station Kurt under the direction of meteorologist Kurt Sommermeyer. Meanwhile, crew members of the submarine repaired damage caused by a storm days earlier. 23 Oct 1943 U-537 departed Martin Bay, Labrador, Newfoundland after installing Weather Station Kurt and repairing the submarine's storm damage.